A batch of delicious, fluffy, salty topped, pretzel rolls recently made their way into the studio kitchen/break room. If there are pillows in heaven, they’re made from pretzel rolls… well, maybe not pillows, the tops are rather firm, perhaps stadium cushions then? Yes, stadium cushions in heaven are definitely made of pretzel rolls. lol. 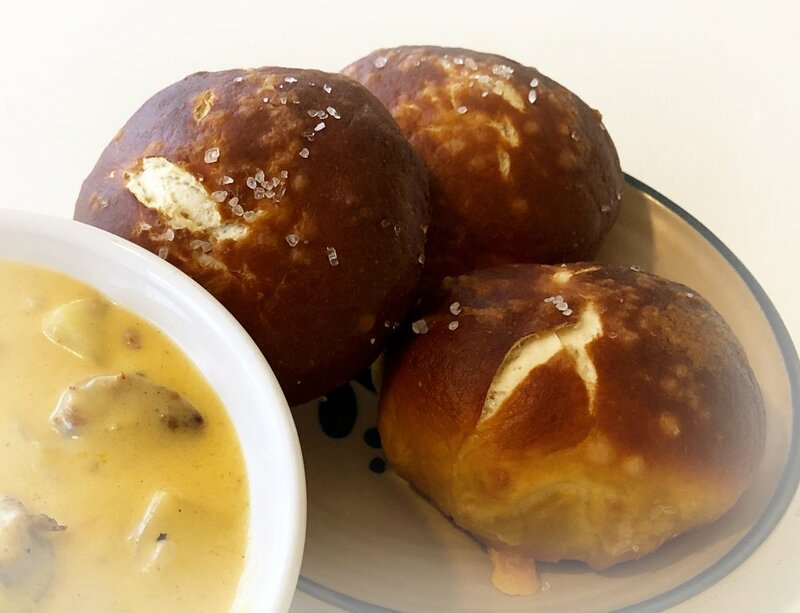 So add these pretzel rolls to your offensive line-up for January play-off games and well beyond. They’ll go perfectly with any soup, chili, or stew, next to a leafy green salad, and paired with innumerable main dishes. Don’t let the three stages of directions for the rolls daunt your enthusiasm, it’s a relatively easy process, but a written explanation can seem a bit overly-involved. It’s not. Combine the flour, yeast and salt in a large bowl. In a medium bowl, whisk together the warm water and melted, cooled, butter. Add to the flour mixture and mix with the dough hooks until well combined. If dough is too sticky, add more flour. Transfer the dough to a work surface kneading and punching-down until a smooth and elastic ball of dough. Place the dough back in the bowl, cover with a tea towel, and let rise in a warm place, or 100°F (35°C) warm oven, for 60 minutes until doubled in size. When the dough has doubled, punch it down, return to work surface, and knead for about 30 seconds. Divide dough into 10 equal (roughly 3-ounce) portions. Dust your hands with flour, roll dough for about 10 seconds until round and firm. This process creates surface tension and prevents the buns from becoming flat. Continue with the remaining dough, then cover with a tea towel and let rise in a warm place for about 20 minutes or until puffy. Preheat the oven to 425°F and line 2 baking sheets with parchment paper. In a large wide pot, bring 4¼ cups of water and baking soda to a boil. (Careful, it will foam up!) With a slotted spoon or ladle, slip two rolls into the boiling water and cook for 30 seconds, turn them over, and cook for another 30 seconds. Make sure they are not sticking to the bottom! Transfer the rolls to the lined baking sheets, score the tops, and sprinkle with coarse sea salt. Repeat for all rolls, then place them onto baking sheets. Bake, one sheet at a time, for about 15 minutes or until golden brown. Eat warm with butter, or store in a sealed bag or container for up to one week.